CARFAX 1-Owner, LOW MILES - 32,391! FUEL EFFICIENT 36 MPG Hwy/27 MPG City! Heated Leather Seats, Navigation, Keyless Start, Smart Device Integration, Blind Spot Monitor, Onboard Communications System, Premium Sound System READ MORE! Leather Seats, Navigation, Heated Driver Seat, Premium Sound System, Satellite Radio, iPod/MP3 Input, Onboard Communications System, Aluminum Wheels, Keyless Start, Smart Device Integration, Blind Spot Monitor, Cross-Traffic Alert, Heated Seats, Heated Leather Seats. MP3 Player, Keyless Entry, Steering Wheel Controls, Heated Mirrors, Electronic Stability Control. 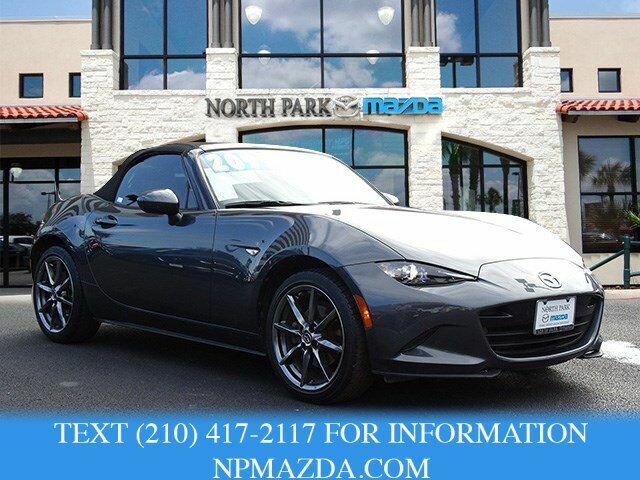 Mazda MX-5 Miata Grand Touring with METEOR GRAY exterior and TAN GRAY interior features a 4 Cylinder Engine with 155 HP at 6000 RPM*. "Like every MX-5 before it, the 2016 model is best when the road turns twisty. It zips around turns with an enthusiasm few other cars can match, while the efficient four-cylinder engine makes enough power and sound to keep the good times rolling." -Edmunds.com. Great Gas Mileage: 36 MPG Hwy.